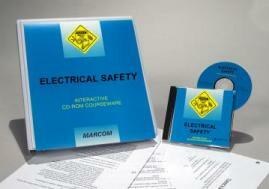 MARCOM's "Electrical Safety" Interactive CD-ROM Course provides the information employees need to work safely around low voltage electricity. The Course also satisfies the OSHA training requirements under 29 CFR Part 1910.331 for "non-qualified" employees. Electricity is all around us. It lights up our homes... powers much of the machinery and equipment that we use... and runs many of our tools. We are so used to it, most employees "take it for granted". Yet electricity can also be dangerous. Employees need to know how electricity works, and what they should do to protect themselves from its hazards. Areas covered in the course include how electricity works, fuses and circuit breakers, grounding and GFIS, safe work practices, outlets, plugs and extension cords, working with electrical equipment, using ladders around electricity, electrical emergencies, and more. Using a powerful combination of audio, full-motion video, text and colorful graphics, this course provides the most cost-effective safety and regulatory compliance training available today. The course is divided into a number of logical sections so information is easily understood... and retained. Also designed with the training manager in mind, all courses in the Interactive CD-ROM Training Library include a learning management system (at no additional cost). Using this system, trainers can set up "Pre" and "Post" tests... establish log-in procedures... even define and set up curriculum for various job classes. The system also collects and organizes employee performance information through a powerful relational database, which can generate a number of record-keeping and tracking reports... and has a database "import/export" feature, which allows information to be transferred to and from an external database (such as a company's personnel database). The course is one of over 100 titles currently available in the Interactive CD-ROM Training Library.